Delhi job aspirants have some huge government job vacancies to apply for in recent times. Candidates can apply for 1600+ active government jobs vacancies doing the rounds now. Candidates residing in Delhi, NCR and nearby states can easily apply for these jobs through the links pasted below. 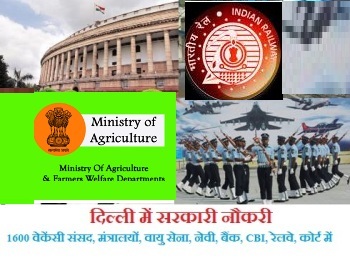 Various types of government jobs are published in the recent past, making it easy for Delhi people to apply for some highly important government jobs. Each and every job published in important and holds important organization name. Parliament of India, Supreme Court, CBI, RBI, various Ministries are some names included in the list of offering jobs. Ministry of Finance is offering the highest number of vacancies to fill up AAO posts. Candidates willing to apply for this job should it do it by 12 March. Other than this, Field Ammunition Depot is also hiring 210 Tradesman and Other Posts. Matric pass students can apply for this job before 04 March. Just a simple reminder to job seekers that before applying for the jobs mentioned below, do read the notification thoroughly and know the eligibility criteria and other details well enough. In general, candidates possessing graduation degree, secondary pass, senior secondary pass and post graduates can apply for major jobs. For other educational qualification, you need to check details. There are various other jobs for Delhi candidates to be applied. Take a look at the link given below and you will get the details for it.